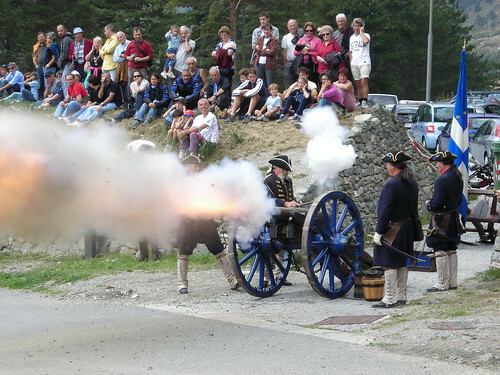 301 years ago here at Fenestrelle was a French fortress. Built to block the Chisone Valley from marauding Waldensians and the Piemontese. 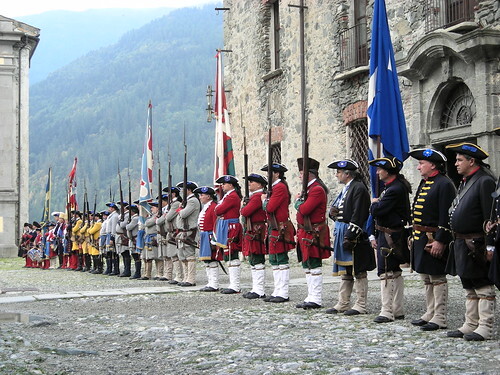 On Sept 12 1708 after 3 weeks of battle the fortress fell to thePiemontese thanks to the help of Austrian and Hungarian allies and the rest is as they say "History". Fenestrelle benefits not just from having the largest fortress in Europe but also from a string of fortifications that surround the area. Fort Mutin is just the most recent of these to begin to be uncovered and made accessible. Exactly 301 years after that siege we have celebrated the rebirth of this ill feted fortification. A fort that followed a perfect text book design but however suffered from one lethal flaw. It was built in the base of the valley, surrounded on all sides by high mountain peaks from where the enemy could shoot down into the fort. The great Vauban visited the fort in 1701 and would have had the fortress demolished if it was not for the fact that it had cost so much to build in the first place. 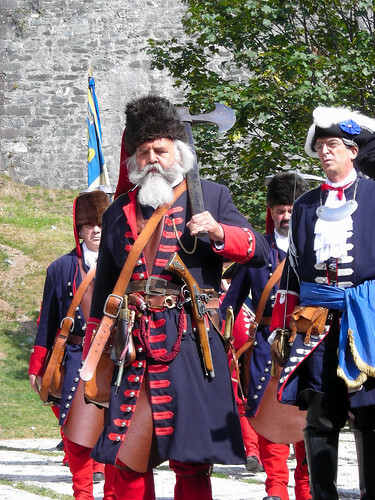 He did however order the construction of several redoubts and fortifications around Fenestrelle of which Elmo, Tre Denti and Fort des Aguilles became incorporated into what we now know as The fortress of Fenestrelle. 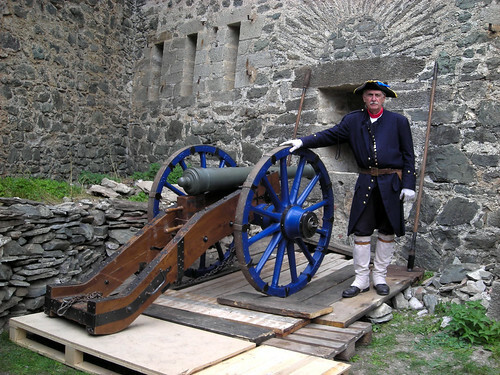 Thanks to this remedial work the fortress lasted for three weeks which was no mean feat when you consider it's position and the fact that 45 Piemontese cannon were firing 200 shots each per cannon per day. 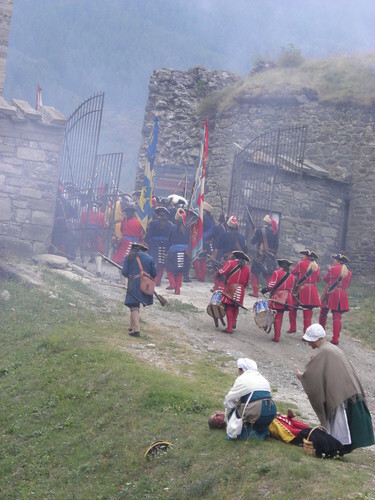 This weekend saw a reconstruction of the siege and a demonstration by the Pietro Micca Association, well known in these parts for their revocation of the siege of Turin and Battle of Assietta. 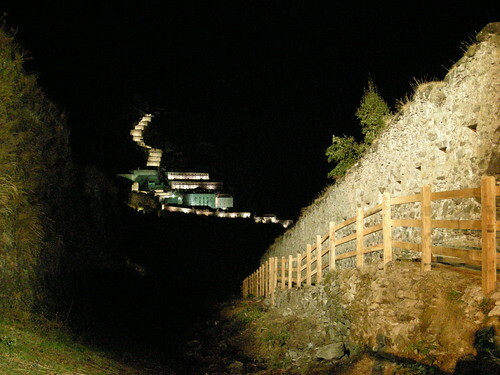 The old walls of Mutin are now visible once again from afar thanks to the clearance of the overgrowing trees and clever illumination. This has once again turned Fenestrelle into the Gateway to the Alps.